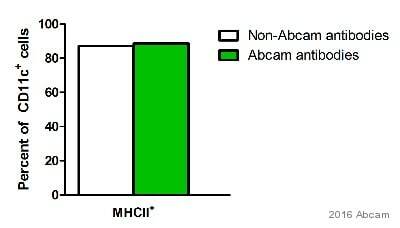 I would like to know if Anti-MHC Class II antibody [M5/114.15.2] (Phycoerythrin) (ab93560) can be used in Balb/c mice. ab93560 recognizes I-Ab, I-Ad, I-Aq, I-Ed, I-Ek, not I-Af, I-Ak, or I-As and a polymorphic determinant present on B cells, monocytes, macrophages, dendritic cells, and activated T lymphocytes from mice carrying the H-2b, H-2d, H-2q, H-2p, H-2r and H-2u. Therefore ab93560 should be suitable for Balb/c mice. Please confirm the exact genetic background of your Balb/c mice to be sure.